When a baby has diarrhea, it can be distressing for everyone involved. Here’s what you need to know when it comes to dealing with diarrhea, including how to tell when it’s time for a trip to the doctor. 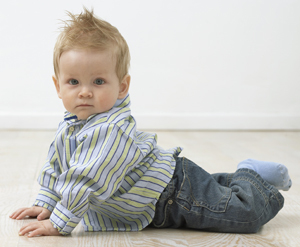 Determining whether or not your child has diarrhea may be harder than you think. It’s not a question of colour—the palette for normal poop ranges from greenish to yellow through to brown. Nor does consistency tell the whole story since some babies normally produce very soft stools. The secret to diagnosing diarrhea is looking for changes in your baby’s typical patterns, such as significant increases in the urgency and frequency of bowel movements, plus a much more liquid than usual consistency. When it comes to determining what’s causing diarrhea, three key factors to consider are how rapidly it comes on, its duration, and whether it’s accompanied by other symptoms (e.g. fever, vomiting). Here’s how to cope with three of the main causes of diarrhea. Sudden onset of vomiting followed shortly by diarrhea point to gastroenteritis—inflammation in the stomach and intestine brought about by viruses (e.g. rotavirus or norovirus). Your child may have a low-grade fever and no appetite. As it is contagious, there may be others in your baby’s play group or at home with similar symptoms. Diarrhea is Mother Nature’s way of evicting these viruses, so don’t give your baby anti-diarrhea medicines to stop it. While the body can fight off most infections like these on its own, vomiting and diarrhea can dangerously deplete the body’s water and electrolyte stores very quickly. As such, warding off dehydration is the key to a safe, speedy recovery. If breastfeeding, continue to feed your baby on demand or at least every two hours. Oral rehydration solutions, which contain just the right balance of sugar and salts to maximize fluid absorption, can be offered in small amounts (60 to 120 mL) between feedings if you are worried about possible dehydration. Ask your Shoppers Drug Mart Pharmacist to recommend a suitable oral solution. Over the next 12 to 24 hours, babies can be given other fluids or formula if they’re already a part of their regular menu. Afterward, feed them whatever tempts their appetites. Diarrhea may linger for a week or so but as long as they are happy to eat, then a normal diet is best. An infection in the middle ear or even the urinary tract can also trigger diarrhea. Diarrhea in conjunction with fever, but little or no vomiting, could hint at one of these conditions. Diarrhea often occurs in the wake of antibiotic treatment, which can upset the normal balance of bacteria that live in the intestine. Repopulating the gut with beneficial bacteria using a probiotic supplement (ask your Shoppers Drug Mart Pharmacist for a recommendation) or live-culture yogurt may help restore equilibrium.